It’s not every day you get the chance to purchase a slice of history, but what if you had the opportunity to live in it? For those with a spare £5.5million or £1.8million, some of the Frank Lloyd Wright portfolio is up for grabs. Lloyd Wright’s groundbreaking buildings (both residential and public) include the iconic Fallingwater and Guggenheim Museum. As a genuinely pioneering designer, many projects were so far advanced that the American people could not relate to their appearance and (as with many visionaries) were branded as inappropriate or ill-conceived. Two such Californian properties are now available to purchase. ‘Millard House’ ($7,733,000) is recognised as Lloyd Wright’s earliest Usonian house, introducing the intricately patterned textile block system. The bold facades and double-height interiors sit comfortably with today’s modern lifestyle, yet the house has stood for 86 years! The beautifully landscaped grounds perfectly compliment this angular construction. The second desirable property is the ‘Fawcett Ranch House’ ($2,700,000), a single-storey oasis set amongst 76 acres of the San Joaquin Valley. 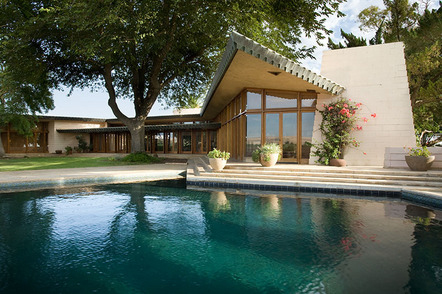 One of Lloyd Wright’s last projects, this incredible building again appears to shun 1960s convention and presents stunning angular details in the outdoor pools, roof shape, skylights and feature kitchen. Walls of glass make the roof appear to float, as if suspended and ready for flight. I have always admired the work of Frank Lloyd Wright and when I chanced upon these two unique properties my thoughts immediately turned to the experience of living in such historically important buildings. Something I love about owning a house is being able to add character and to make it your own. How could you possible do this in the Millard House or Fawcett Ranch? I would always feel as if I were merely the custodian, holding onto and maintaining something significant for the next owner so that they could in turn repeat this. Try hanging a plasma screen on an intricate wooden feature wall or installing your Smeg freezer and microwave in an authentic 1920s kitchen. I think I’ll stick with a self-build as the pleasure is in creating something challenging yet personal.